Nikki concentrates primarily on still life painting using both oils and gouache. She focuses on composition and color and the interlocking structure of carefully arranged still life objects. 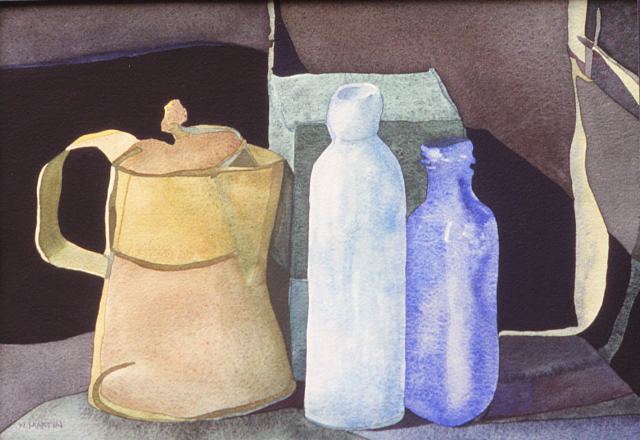 Evident in her work is a calm brought about by both the compositional and color choices. After graduating from Louisiana State University in 1972 with a BFA in painting, Nikki worked in print advertising, then in 1976 moved to Santorini, Greece where she immersed herself in photography and village life. After two years she returned to New Orleans and worked as a free-lance artist, photographer and poster designer and, among others, created posters for the 1981 New Orleans Jazz and Heritage Festival, the Boston Marathon, and the 1981 Mardi Gras. She has work in the Smithsonian Institution and her work was included in the Library of Congress Exhibition of National and International Poster Artists. Her art is in many private collections in the United States, Europe and Australia and has been shown in many local and regional exhibitions. After many years as an Advertising Director (print) then as Executive Producer for Morrison Productions, New Orleans (television commercials), Nikki decided to return to art full time. She studied at the New Orleans Academy of Fine Arts from 1989-1992 and was the recipient of the 1990 Scholarship Award. She joined the NOAFA staff in 1993 and the Faculty in 1998 to teach Color and Design.